Hello Beady Friends!! So I must tell you… the holidays we celebrate at this time of year are simply some of my favorite. I’m reminded of family, yummy food, lovely – sometimes dazzling – decorations, and traditions near and dear to my heart. 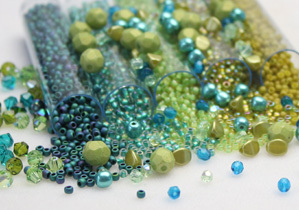 In today’s blog, I’m going to provide some holiday-inspired color palettes that are sure to excite your creative little beady fingers into creating some extra-stunning jewelry with which to finish off 2018! Previous Post NOVEMBER BIRTHSTONE: THE TERRIFIC TOPAZ! Next Post The Merry Merry Earring!